The 2017 Forester gains additional standard equipment and several new options including a heated steering wheel. Subaru of America has taken the wraps off the 2017 Forester. Looking instantly recognizable, the updated model has a new front fascia and a revised grille that is flanked by new headlights. The crossover has also revised LED taillights and a body-color rear spoiler on higher-end variants. Rounding out the changes are restyled wheels and a newly available Sepia Bronze Metallic exterior that is exclusive to the Forester Touring. The headlights can be equipped with a new High Beam Assist system that works with the EyeSight system to automatically switch between high and low beams depending on driving conditions. The highlights also turn in the direction of vehicle travel on higher-end variants. Interior changes are fairly limited but designers installed a new multi-function steering wheel as well as additional sound deadening material. The 2017 Forester also has thicker door glass and improved door seals to further reduce wind noise. 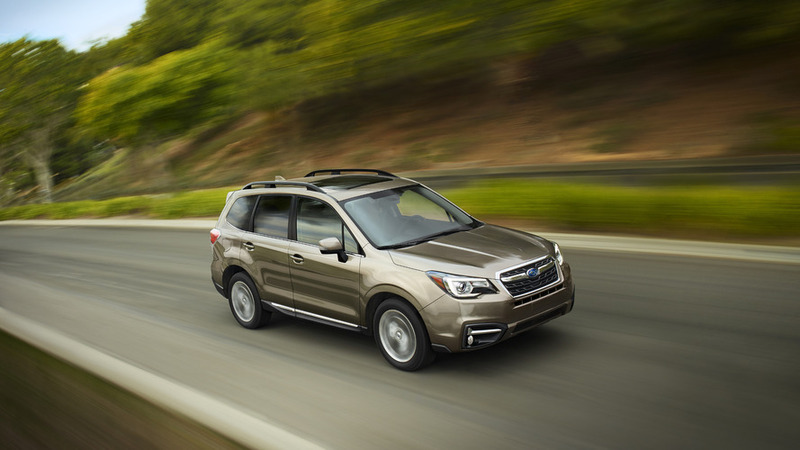 Last but not least, the Forester gains additional standard equipment as well as several new options including a heated steering wheel, a Keyless Access system, and Saddle Brown perforated leather seats with contrast stitching. On the safety front, there's an updated EyeSight system that uses color cameras which provide a wider and longer field of vision. The EyeSight system also includes Lane Keep Assist, Blind Spot Detection, Rear Cross Traffic Alert, and Reverse Automatic Braking on certain models. Engine options carryover but several revisions to 2.5i CVT models improve the crossover's fuel-economy rating to 26 miles per gallon city / 32 mpg highway / 28 mpg combined. At the other end of the spectrum, the Forester 2.0XT Touring gains a new Active Torque Vectoring system.